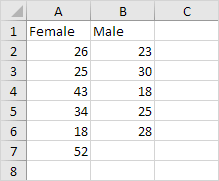 This example teaches you how to perform an F-Test in Excel. The F-Test is used to test the null hypothesis that the variances of two populations are equal. Below you can find the study hours of 6 female students and 5 male students. To perform an F-Test, execute the following steps. 2. 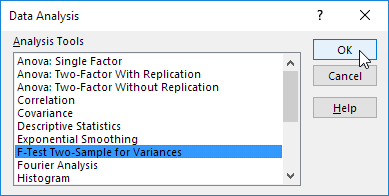 Select F-Test Two-Sample for Variances and click OK.
3. Click in the Variable 1 Range box and select the range A2:A7. 4. 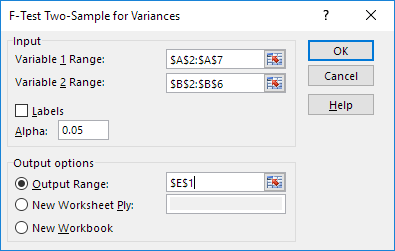 Click in the Variable 2 Range box and select the range B2:B6. 5. Click in the Output Range box and select cell E1. Important: be sure that the variance of Variable 1 is higher than the variance of Variable 2. This is the case, 160 > 21.7. If not, swap your data. 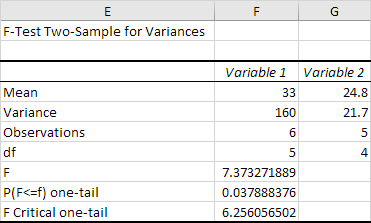 As a result, Excel calculates the correct F value, which is the ratio of Variance 1 to Variance 2 (F = 160 / 21.7 = 7.373). Conclusion: if F > F Critical one-tail, we reject the null hypothesis. This is the case, 7.373 > 6.256. Therefore, we reject the null hypothesis. The variances of the two populations are unequal.